I'm sure you've seen the frenzy over Masked Affair by now. You might even be clamoring for it yourself. It's going for up to $25 on eBay. People are desperate for it. When I first spotted it at a local Wegmans after xmas, my initial reaction was mild. "Oh look. 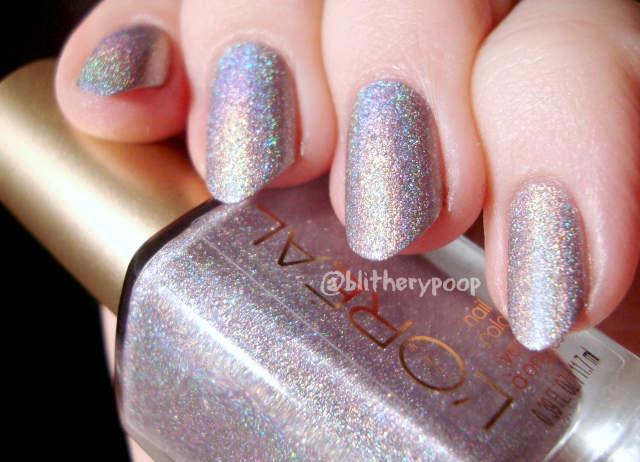 This is kinda holo." Then everyone lost their minds over it. I kept going back and holding the the bottle, but putting it back because...meh. Then McGee wanted it. Her birthday is coming up and I love being womantic (girl version of "bromantic", thanks Cat!) and indulging her. I told her I'd buy a bottle and swatch it. If I liked it, I'd keep it and get her a new one. If not, she could have the swatched one. Well...she's getting the bottle from this post. You'll see why. 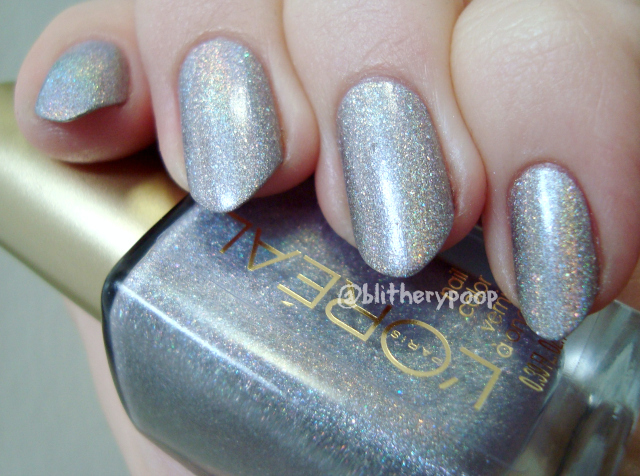 Masked Affair is a faintly lilac gray holo with fine and coarse particles. Wow. What's all the hype about again? This stuff? Really? The photo above is how it looked most of the time when I wore it. The letdown doesn't end there though. It's a hassle to apply. Patching problems galore and the occasional clump of something really made it challenging. I had to do three coats to get it even. 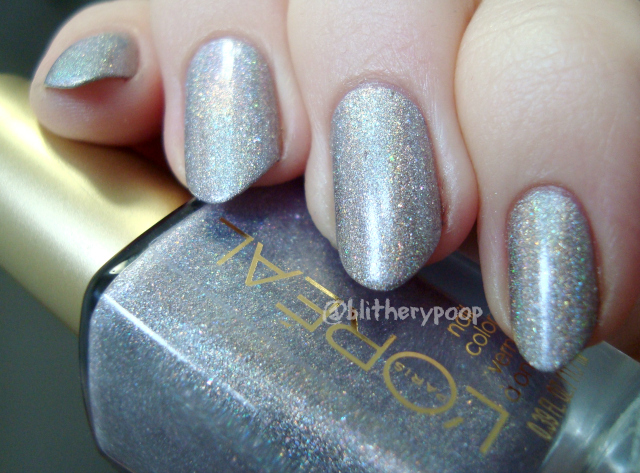 I didn't topcoat it because I've heard from others that it dulls. No way I was gonna apply it again! It's also not anywhere near as purple as some photos I've seen. There's a purple-ish-ness to it...kinda. Very kinda. It's a slightly lilac-y gray on me. I'm decidedly unimpressed by it in my usual hybrid indirect sunlight and daylight CFL lighting, but figured maybe I could get something out of it in other conditions. I tried, a lot. Ok, kinda. Let's see how it looks outside. poor attempt at sunlight...too cold to stay and wait! Oh no! *dashes back inside* Why did I do that? So cold...and not sunny. Stupid winter. At least the larger holo particles look kinda cool like this. Maybe an awkward angle will help? Sorta. I'm almost upside-down at this point though. It never looked like this without serious effort. 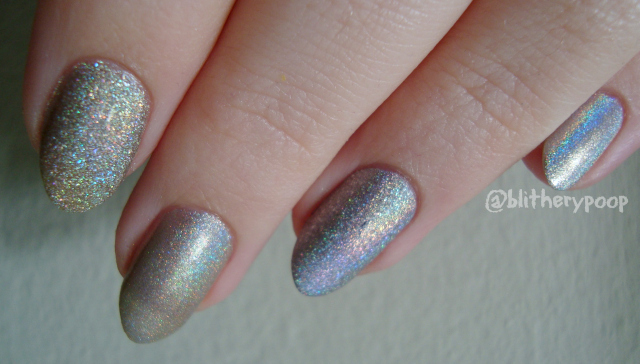 Beyond that, even at its boldest it's still that sorta pastel-ish holo and not a vibrant in-your-face rainbow. Time to get under the way too bright LED lamp of doom! Sorry if you're blinded by these next two photos. This is it at the absolute maximum flame I could get out of it. This lamp is so bright that you can almost see through my skin though. 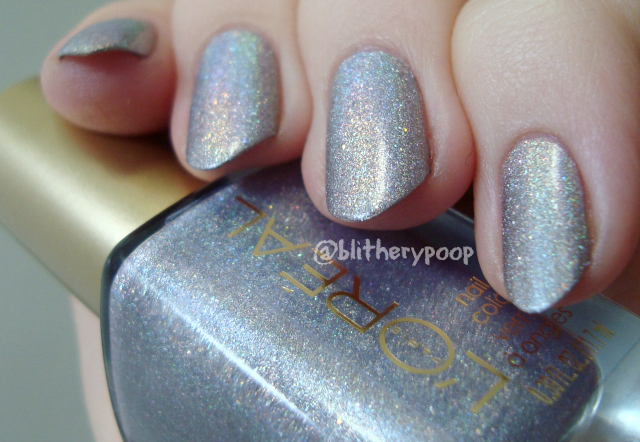 I want into my stash and pulled out a variety of other holos for a comparison. I don't own any lilac-gray ones, so they're all silver. They're all slightly different types. 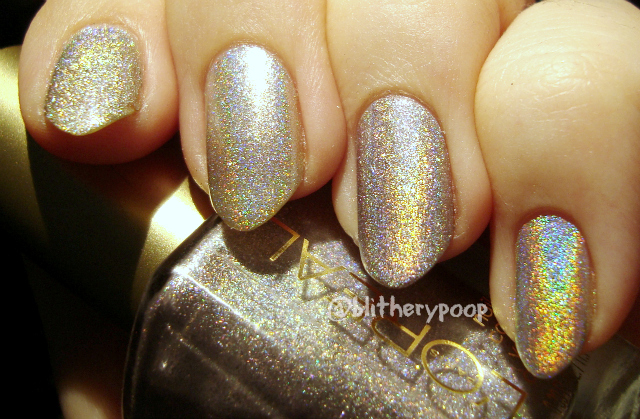 Milani HD is just coarse holo particles in a clear base, without any silver pigment. 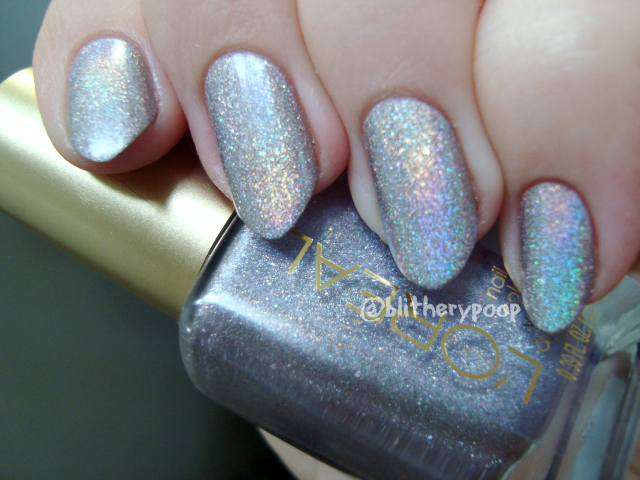 Joss Diamond Flash is a holographic silver foil with little pink flecks that are impossible to photograph when it's only on one nail. 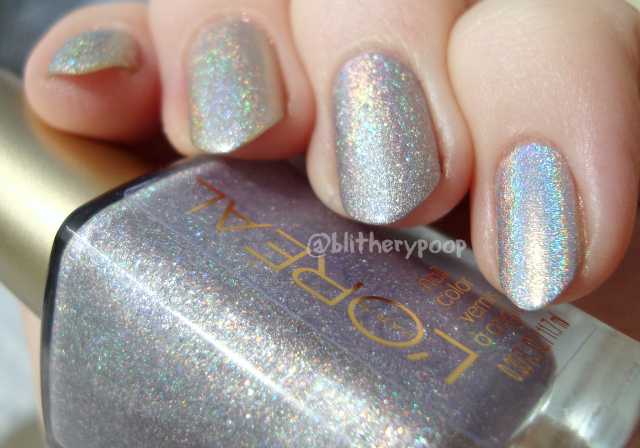 Urban Outfitters Silver Holo is a rebranding of Color Club Harp On It, and it's the same really dazzling medium linear holo. To really highlight the differences, I took another ton of photos in different spots and different lighting conditions. At their mildest flame, the differences are pretty strong. I love that Diamond Flash is never dull because it's also a foil. I've wanted something like that for years! 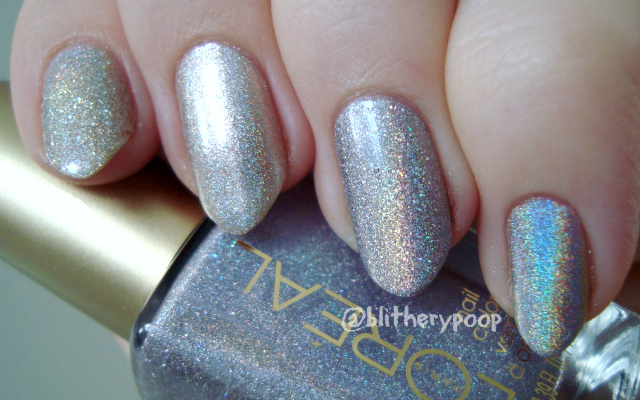 Masked Affair's larger particles also keep it from looking flat or cloudy like a lot of holos do...but you see that clump? None of the other three have clumps. 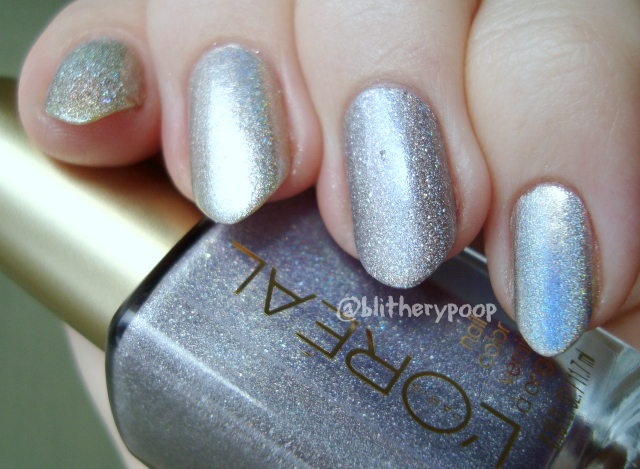 Masked Affair's softer flame literally pales next to Silver Holo. Still, the flame is bolder and easier to catch than either the Milani or Joss ones. Sunlight makes them all glow and shows what I mean about "pastel" colors in Masked Affair's flame compared to the rainbow in the Joss and Urban Outfitters holos. ...and an awkward angle so you can kinds see all the nails "face-on" at once. Bottom line: I paid $5 for this bottle at Wegmans. I won't be buying one for myself at that price. Even if I see it on clearance somewhere, I'll probably still pass. I think that says it all. 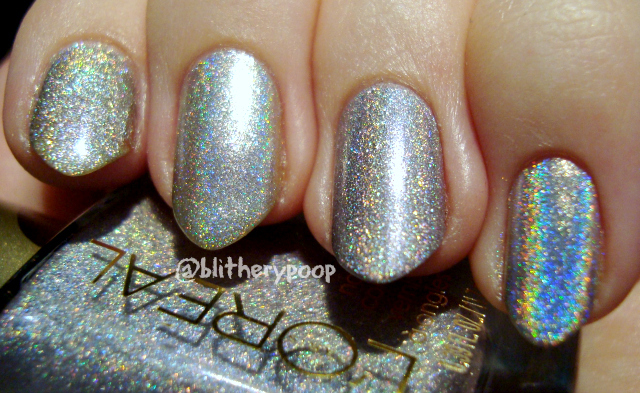 There are much better holos out there. While I'm kinda happy to see a holo at a drugstore again, I'm also sorta worried that the troublesome formula might turn newbies off. It doesn't even begin to live up to the hype. I have my suspicion that something on ILNP's Instagram might be their answer to Masked Affair. We can hope, right? Barbara can get it right where L'Oréal missed the mark. Also...call me paranoid, but why do I get the feeling one of my comparison photos will be used on eBay or Storenvy without a note that it's a comparison? I was tempted to label it. Oh, wow...I was one of those people searching for Masked Affair, but I'll stop now. 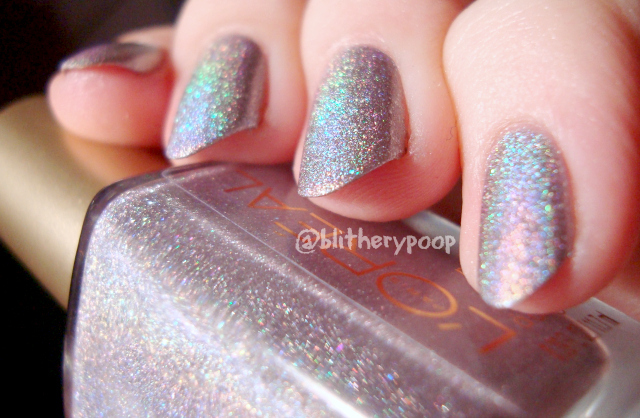 I would hate to spend $ on a holo, only to be disappointed by it. Thank you for the pictures. 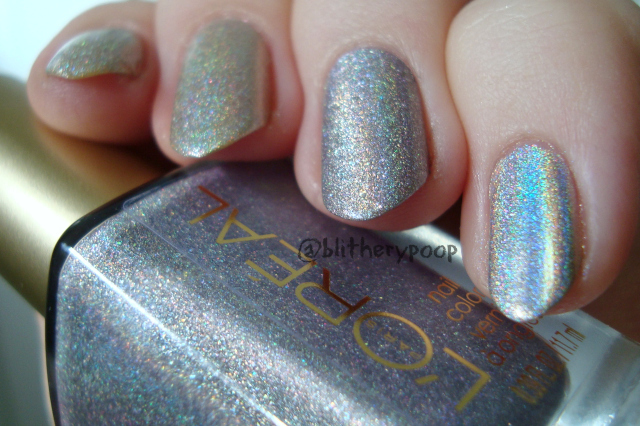 BTW, have you ever done a 'favorite holos' post? I have to admit I was let down by this one too, but then because it was such a damn hassle to get on (I did a full Mani thinking I would love it) I left it. Wouldn't ya know I fell in love with it? I found myself digging it, not for its "holo-y ness" or lack thereof, but something about the softness and texture of the finish just kept on catching my eye. Huh. Guess it grew on me? !